Coventry City suffered their third League One loss in a week as Rochdale's late penalty dealt another blow to the Sky Blues' automatic promotion hopes. Chris Stokes brought down Ian Henderson inside the area in the 89th minute. And the Dale striker kept his cool to score and earn his side their third win in four matches. Visiting keeper Josh Lillis had kept his side in it with fine saves from Joe Cole, teenager James Maddison and then at the death from Adam Armstrong. 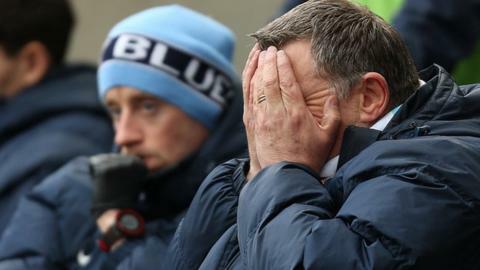 Tony Mowbray's City drop out of the play-off zone to seventh, three points behind Barnsley - and now 16 points adrift of leaders Burton Albion. "It was deserved looking back on reflection of the game. I think we controlled a lot of possession and nullified the opposition's threats. "We couldn't do it for the whole 90 minutes because their attacking intent and prowess is superb. We managed it quite well to keep Josh Lillis to making only a few saves. "I thought we had our own opportunities but I thought we might not get the luck we deserved then after Ian Henderson had a goal-line clearance but it was a stonewall penalty and Henderson put it away well superbly." Match ends, Coventry City 0, Rochdale 1. Second Half ends, Coventry City 0, Rochdale 1. Romain Vincelot (Coventry City) wins a free kick on the right wing. Foul by Jacob Murphy (Coventry City). Attempt blocked. James Maddison (Coventry City) right footed shot from outside the box is blocked. Sam Ricketts (Coventry City) wins a free kick in the defensive half. Goal! Coventry City 0, Rochdale 1. Ian Henderson (Rochdale) converts the penalty with a right footed shot to the bottom left corner. Penalty conceded by John Fleck (Coventry City) after a foul in the penalty area. Callum Camps (Rochdale) is shown the yellow card. Attempt saved. Jacob Murphy (Coventry City) left footed shot from the left side of the box is saved in the centre of the goal. Attempt saved. Jamie Allen (Rochdale) left footed shot from outside the box is saved in the centre of the goal. Attempt blocked. Matthew Lund (Rochdale) left footed shot from outside the box is blocked. Substitution, Coventry City. Marc-Antoine Fortuné replaces Joe Cole. Substitution, Rochdale. Grant Holt replaces Nathaniel Mendez-Laing. Attempt missed. Matthew Lund (Rochdale) header from the right side of the six yard box is close, but misses to the left. Substitution, Coventry City. Jacob Murphy replaces Ruben Lameiras. Attempt blocked. Niall Canavan (Rochdale) header from the centre of the box is blocked. Corner, Rochdale. Conceded by Reice Charles-Cook. Attempt saved. Jimmy McNulty (Rochdale) left footed shot from the left side of the box is saved in the top left corner. Foul by Ruben Lameiras (Coventry City). Jimmy McNulty (Rochdale) wins a free kick in the defensive half. Ashley Eastham (Rochdale) wins a free kick on the left wing. Substitution, Rochdale. Callum Camps replaces Donal McDermott. Ian Henderson (Rochdale) wins a free kick on the right wing.